Why has the consumer culture in the US become so youth-obsessed? Why has the word “coveted” become inextricably attached to the words “18-34 year olds” among media planners and buyers? After all, it doesn’t take much more than a quick Google search to discover that older demographic segments spend much, much more. We’ve grappled with these questions for quite some time. As a firm that conducts a lot of research among youth and on youth topics, we’ve certainly benefited from the nation’s obsession with youth. Young people do have a lot of money to spend. Depending on whose projections you want to trust, teens spend somewhere between $150 and $200 Billion a year. That might sound like a lot, but when you look under the hood a bit you will find that the bulk of that spending power is concentrated at the upper end of that age range. Today’s teens certainly have more money to spend than their counterparts did a generation or two ago, but that spending level seems minor in comparison to what older age segments are spending. The real answer as to why the media and marketing world is so centered on youth is INFLUENCE. Young people’s influence on the spending of adults is somewhere between 5 and 10 times their direct spending. Parents feel good when they are spending money on their children (and this type of spending is more immune to the business cycle than other types). Older people feel good when they buy products that have passed a “youth cool test.” Young consumers have become the arbiters of what is cool, and adults want to jump on board. 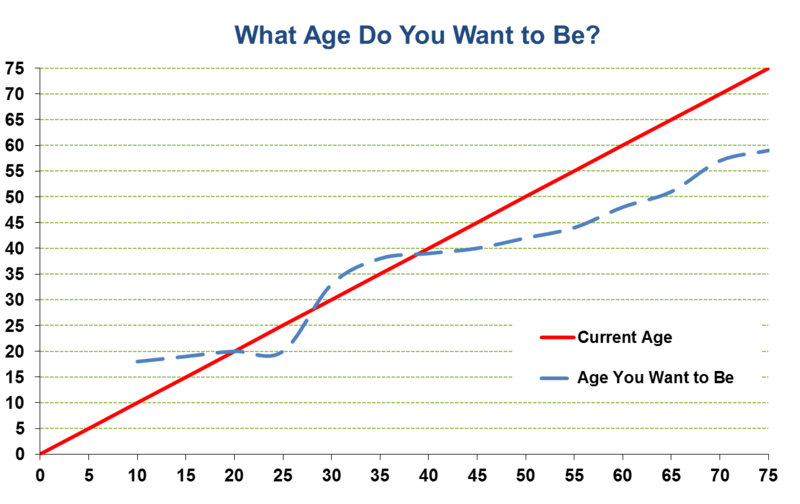 The chart shows that up until about age 20, most people aspire to be older than they currently are. That is well known in youth marketing – so to attract say, a 12 year old, you put teenagers in the ads. It appears that in your 20’s and 30’s you are roughly happy with the age you are, but the moment you hit 40 you start to wish you were younger. Mid-life crisis anyone? Finally, just as kittens become cats and puppies become dogs, young consumers become adults. Brand preferences can begin quite young, and a lifetime payoff can be substantial. By way of example, most US adults have a brand preference for Coke over Pepsi or Pepsi over Coke. Most will also drink the other brand if their preferred brand is not available. But, when faced with a choice of both, adults tend to show a brand preference that does not change over their lifetime. When is that brand preference formed? Early – likely by middle school. The lifetime value of establishing this preference early is huge, which explains why both brands continually race each other for the youth market. So, youth are a substantial market, have an influence many times their size, and eventually become adult consumers. All the ingredients for a youth obsessed culture are in place. I was recently reading an article that discussed how in China, the population reveres it older members. Evidently it is the law in China that you have to look after your parents in their old age, and there have been cases of elderly parents successfully suing their children for lack of support. Revering the old is not just cultural, it is mandated by the government. Our youth-obsession is a western-dominated concept, and one you don’t see in less consumer oriented areas of the word. The most interesting call I ever received as a result of a poll we conducted was from a college student. We had released a data point demonstrating that college students have an enormous amount of uncommitted, free time — 8.5 hours a day on average to be precise. We defined discretionary time as time students are not sleeping, going to class, studying, working out, commuting, or working at a paid job. What is left is time that is up to the student how to use. The college student called to tell me how this data point must be wrong, because all the college students she knew were incredibly busy. After mentioning that she must be hanging with a different crowd of people than I hung with in college, I told her to call me back in 10 years when she had a career, a spouse, a couple of kids, and a house to maintain. I suggested it is likely a matter of perspective and how you view your discretionary time, and that perhaps time that she considers “obligations” our researcher’s eyes classify as discretionary. In the context of many decisions we make, we trade off the concepts of “time” and “money.” In the short-run, both are fixed commodities. In the long run, our financial situation may change for better or worse and our concept of time may change even though each day remains at 24 hours. Our discretionary income follows a well-known path in our lifetime. It starts at zero when we are born, grows to a modest level as teenagers, tends to level off through the college years, grows considerably in our working years, and then falls off in retirement. Discretionary time follows a different pattern. It starts out very high, moderates in the school years, grows considerably in the college years, and then pretty much falls off a cliff as individuals are raising their own families and building their careers. Discretionary time then moves upwards during the empty-nester time frame, and then is maximized in retirement. Note that we define discretionary time as “uncommitted” time – time that you get to choose how to spend. 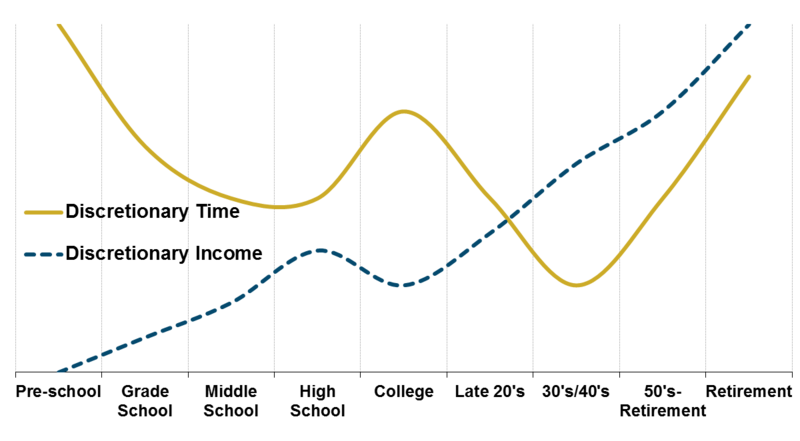 The graph below illustrates how time and money progress over our lifetimes. The interesting part of this for marketers is that “time” and “money” are often used to “buy” each other. We can buy more discretionary time by outsourcing aspects of our lives. I don’t change my own oil, plow my own driveway, or iron my own shirts. In all these cases, I value the time saved by not having to do these things more than the money it cost to outsource them. This relationship goes the other way as well. We can use “time” to save “money.” I’ll sometimes spend hours on the Internet to find the best price for a flight or a hotel room. I’ll drive an extra 15 minutes to a grocery store because something I like is on sale there and not at the store closer to my home. Look again at the graph above. The most interesting life stages are the ones where there is a big gap between the time and money lines. An obvious place where this happens is the college years. This is a time frame when consumers have relatively little discretionary income, but relatively high discretionary time. This concept is why for years we have been saying that college students are pretty much the most savvy consumer group out there. They are smart (hey – they are in college! ), highly connected with each other, necessarily frugal with their funds, and have enormous amounts of time to research products and prices. But, they are more than cheap customers who have a lot of time to find the best price. They emerge as adult consumers, and lifelong associations with brands often start in the college years. Another interesting point on the graph is at mid-career (30’s-40’s). This is the point where there is the largest gap between discretionary income and discretionary time. So, this is the life stage where we most see consumers trading money for time. Price sensitivity tends to be at its lowest during this time frame.